A few months ago I read with considerable interest an article that appeared in one of the issues of Scouting magazine under the title “Be Prepared for Life.” That took me back to my boyhood days, and I remembered that I could hardly wait for the time to arrive when I would be old enough to become a Boy Scout. Finally that time did arrive, and I came under the influence of some very dedicated leaders. They taught me what it meant to say, “On my honor I will do my best.” And I learned that the Scout motto, “Be Prepared,” meant that I should strive diligently on a continuous basis to try to so develop myself physically, mentally, socially, morally, and spiritually that I would be prepared for whatever came my way. Those were choice days, those Scouting days, and I had the opportunity to participate in many exciting activities. They were teamed up with some very choice spiritual experiences in my home and in Church, particularly in the Aaronic Priesthood, the Sunday School, and the MIA. As a result, the horizons of my understanding were pushed back and I gained a more complete understanding than I had had up to that point on the purpose and meaning of life. He also said that in these latter days Satan would “rage in the hearts of … men, and stir them up to anger against that which is good. “And others he will pacify and lull away into carnal security, … and leadeth them away carefully down to hell. I should like to emphasize, my brothers and sisters, that those words of Nephi apply to some members of our Church today and not just to some individuals who are not members of our Church. May I suggest that all of us do some soul-searching on that matter and make whatever corrections are necessary to get back on course. It has been said that when the time to perform arrives, the time to prepare has passed. Now, while that is true in many situations, it is not universally the case. Those of you who have taken part in athletic competition, particularly in track-and-field events, know that while an individual goes to great pains and puts in many hours of hard work trying to build a strong base from which he might be able to perform at his best, preparation actually continues during the competition and right during the performance time. So we need to keep that in mind, too. This is not just a once-over deal; it is something that can be added upon from time to time. Those of you who have participated in jumping or throwing events in track and field know that a competitor is not eliminated after one attempt. He gets three tries at a certain height, or three broad jumps and so on, before his competition has ended. And those who take part in distance racing go around the track a number of times before the race is ended. May I suggest that the foregoing also applies to our opportunities to prepare for eternity, provided we do not procrastinate our repentance until the end. In life we can alter our course through repentance, get back on course, and proceed vigorously toward that great goal of eternal life. Let me emphasize that if we are to qualify for eternal life we must perform righteously in this life. We must strive diligently to make the most of our mortal lives and to be valiant in the service of the Master. Let me emphasize that the sooner we get started on making the most of our mortal life, the better it will be. This, of course, brings into focus the important roles and responsibilities that parents, teachers, and leaders have with respect to getting young people started out right, because it certainly is true that “just as the twig is bent, so is the tree inclined.” (Pope, “Moral Essays.”) But this also points out the responsibility that each individual has to chart a course in life that is in keeping with the gospel of Jesus Christ. Youth is the time to build a strong physical, mental, moral, and spiritual base, to prepare for missionary service and temple marriage, to establish challenging goals, and to experience the satisfaction that comes from worthy achievement. Preparation is not just a personal matter. Every individual, of course, has the responsibility to put his or her own life in order, but we have responsibilities to others also: teachers do, leaders do, and certainly parents do. Parents have the responsibility to put their households in order and to prepare those family members so that every member can qualify for eternal life. Family preparedness in all of its aspects, spiritual and temporal, is of the utmost importance because the family is eternal, and exaltation in the highest degree of the celestial kingdom will actually be family exaltation. 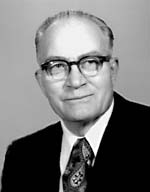 President Joseph Fielding Smith, in his April 1969 conference message, said that procrastination as applied to gospel principles is the thief of eternal life. Do we want to gain eternal life, my brothers and sisters? To be exalted in the highest degree in the celestial kingdom? If so, are we willing to pay the price? And what is the price? Elder McConkie covered that beautifully in his wonderful presentation here today. We must keep all the laws, all the commandments. I want to emphasize that, because I feel it is important, my brothers and sisters, that each of us have a personal interview with ourselves periodically and check up on ourselves and get back on course. As I have visited the stakes and toured some of the missions, I have noted some danger signals which indicate to me that we have many people in the Church, and perhaps most of us would be in this category at least to some extent, who are not doing as well as they could do, should do, and must do if they and their loved ones are to gain eternal life. I testify to you that the things we have heard in this conference, including the things that I have said, are true. The gospel of Jesus Christ is true. It is to be lived. It is my humble prayer that all of us will rededicate ourselves to doing the kind of job we are capable of doing in attaining the joy and happiness in eternity that are there for us if we will just do our part. And this I do in the name of Jesus Christ. Amen.